This is the next best thing to seeing and holding your ancestor's original documents. You're so wrapped up in your genealogy treasures. And rightly so! You've found proof for all those birth names, birth dates, marriages, and deaths. You've got immigration and naturalization records. You've got military records and census sheets galore. Then you visit your cousins and have no good way to share the enormous scope of your family history work. What can you do? The answer is paper. At least, until I invent the family tree hologram. And big paper, at that. I've lived my life at a computer keyboard since 1982. I prefer to keep every genealogy document in digital form. Named logically, filed logically, and backed up weekly. But sometimes paper is the most powerful way to share the joy of your family tree. Here's a project that will help you get those cousins excited about your crazy, obsessive, endless hobby. An inexpensive paper cutter makes this process so easy, you won't believe it. Notice the 12" ruler at the top for scale. You're going to print over-sized documents that your cousins can read. No magnifying glass required. You'll start with your closest relatives—the ones for whom you've found documents. of paper from certain programs. To make these big printouts at home, you have a couple of options. 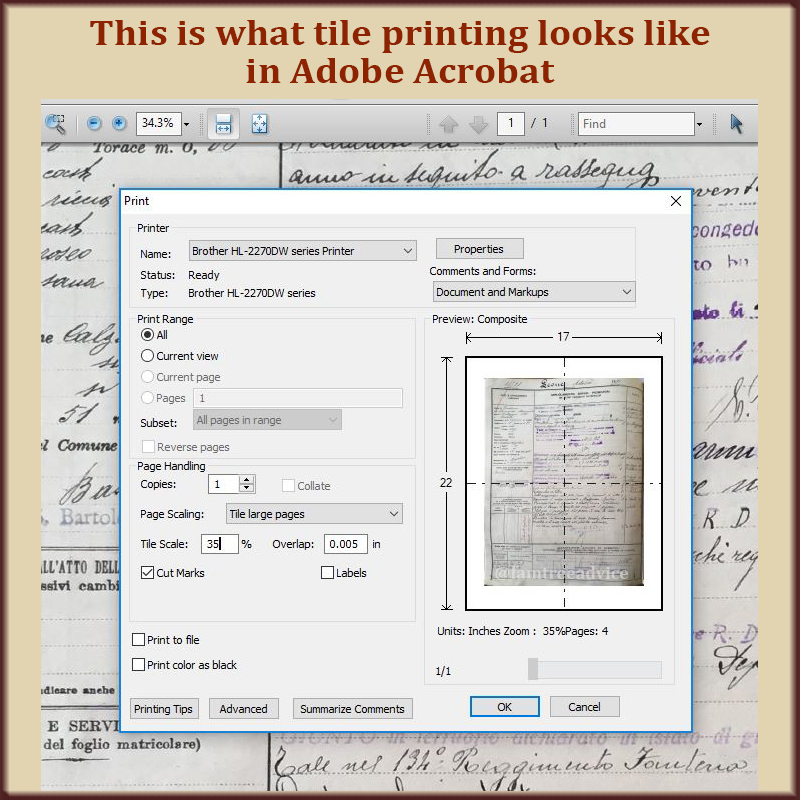 Adobe Acrobat and Microsoft Paint (yes, plain old Paint) let you print your image on multiple sheets of paper. 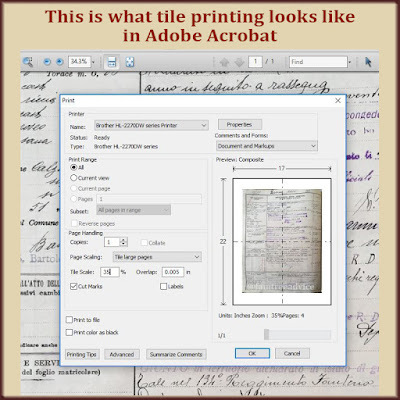 I like Acrobat because it can add "cut marks" that come in handy when you're ready to put the sheets together. In Paint, you can choose how many pages to print to. For example, you might find that 2-pages wide by 2-pages high is a good size. For Mac users, whichever application you use, look for Scale options in the Print dialog. Note: I was able to open a document image in Photoshop and export is as a PDF. This is my best option. Once you print out your images, a paper cutter is the best tool for trimming off the excess. You can find low-priced paper cutters like this one from Overstock. I bought a similar one a few years ago for $15. They should have some in your local craft or sewing store, too. Now line up your trimmed sheets, two at a time. You're going to want to tape them together on the back side. Don't skimp on the tape. It's going to form a very convenient fold-line for storing your oversized document. These big documents are very impressive, and so much easier to read than a shrunken down version. An accordion folder is an easy way to carry a huge number of big documents to your next family gathering. 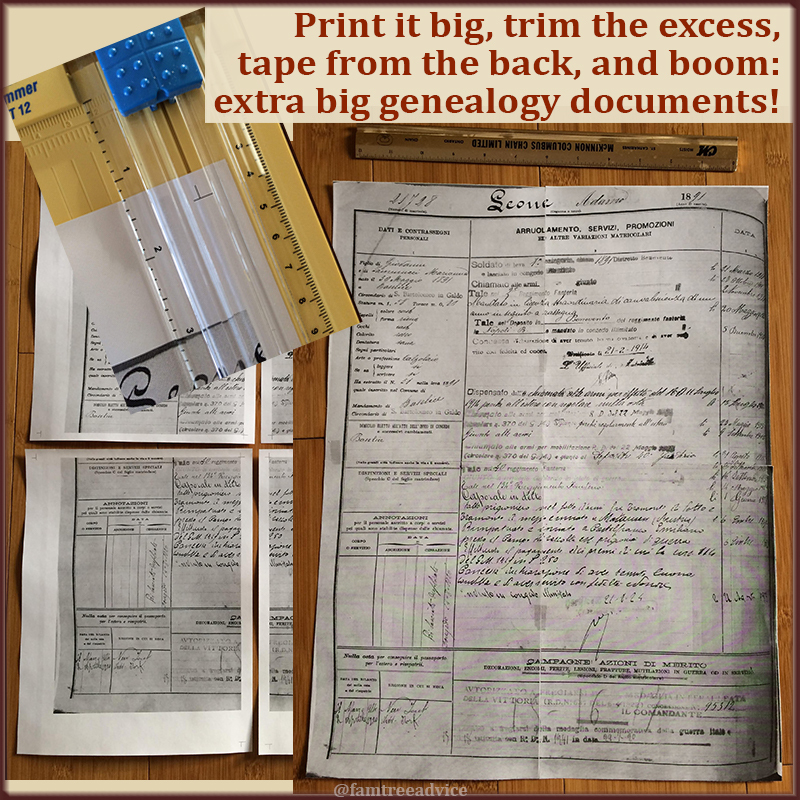 Print and assemble all the documents you like for a particular ancestor. Then fold them down, clip them together, and put them into an accordion folder. 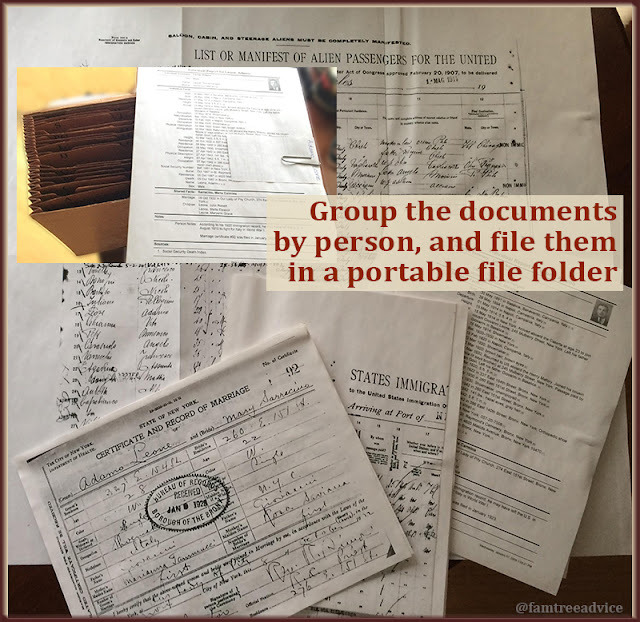 Fill your accordion folder with documents and bring it with you the next time you visit your relatives. I dare your cousins not to light up at the sight of these big, old-timey documents with their ancestor's name on them! Follow along as we figure out what's needed to "finish" documenting my grandmother's family. It's time to work closer to home. Complete your closest families' documents. Last time I talked about 4 keys—4 things to focus on that will make you a better genealogist. One of them was "finishing" your research on individual families. There's never going to be an end to the things you can learn about any given family in your family tree. But you can "close the book" on getting copies of their major documents. You'll find this exercise more meaningful if you stick to your closest relatives. I'll choose my paternal grandmother Lucy, her brothers (Mike and Frank), and her parents (Pasquale and Maria Rosa). The head of this family unit was my great grandfather Pasquale Iamarino. He was born in Italy, came to America in 1902, lived in New York and Ohio, and died in 1969. That's a pretty good haul! But there is a major piece of documentation I've never found for Pasquale. His naturalization papers. The 1910 census calls him an Alien. The 1920 census says he had filed his naturalization papers. 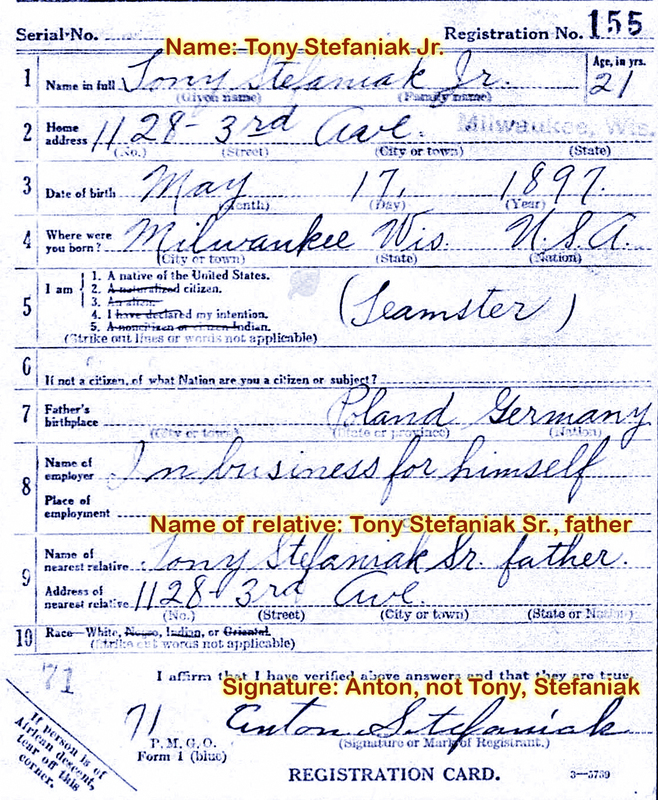 The 1930 census says he is a naturalized citizen. I can narrow it down further with his WWI draft registration card. In September 1918 he was a Declarant. He began the citizenship process by September 1918, but did he file his papers in New York? He lived in Albany in June 1915, and he was an Alien on the 1915 state census. Or did he file his papers when he moved to Ohio? I have a theory that Pasquale moved from New York to Ohio for a better opportunity with the railroad. Maybe the Erie Railroad preferred that he become a citizen. 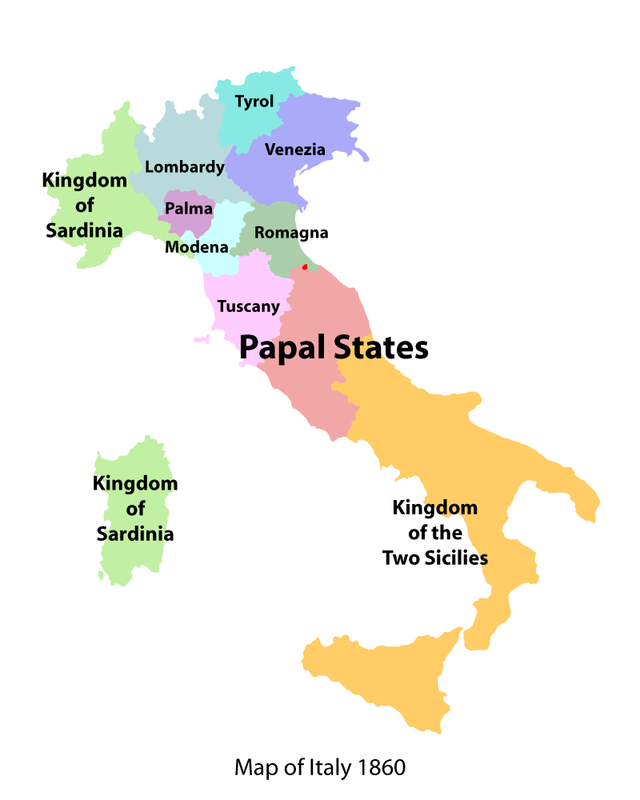 It's a good bet that Pasquale filed his papers in the court nearest to Girard, Ohio, outside Youngstown. 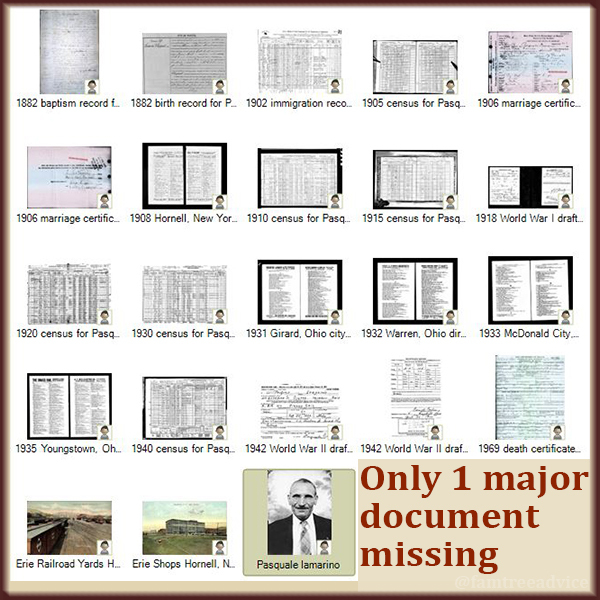 My great grandfather's documents: so close to complete. That's one set of papers I need. What about the rest of this family of five? According to the 1940 census, she never became a citizen. I don't expect to find any other documents for her. Since she doesn't seem to have become a citizen, my great grandmother's documents are complete. I'm missing my grandmother Lucy's birth and death records. Recently I solved the mystery of her missing birth record. I found her in a birth index with a misspelled last name and no first name. Now I have the document number and the wrong last name (Merino). I should be able to order that from New York, and I can order her death certificate from Ohio. 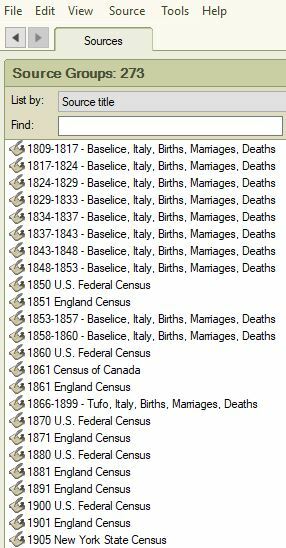 For my grandmother's brothers, my great uncle Mike and great uncle Frank, I have each census and lots of facts. As for their vital records, I have all the dates, but I don't have certificates of their births, marriages and deaths. I don't know about you, but I pay to get certificates only for my closest relatives. My dad loved these, guys, but I'm afraid I never met them. What will you have to send away for? 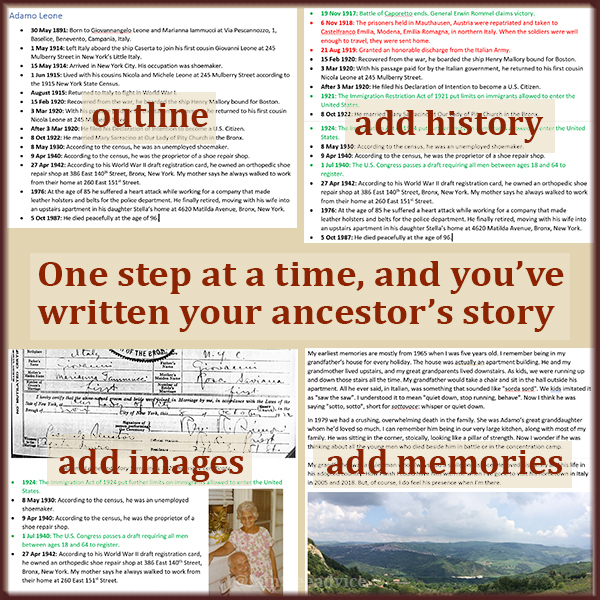 What can you find on a genealogy road trip? Take a day off from one of your distant-cousin-searches and come closer to home. Find the missing pieces for your closest relatives. Then share what you've learned with your family. My great aunt's 1942 marriage. 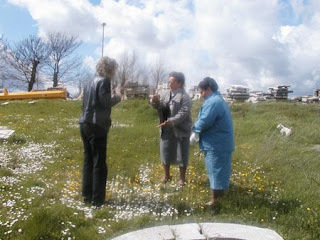 Yesterday I was taking a looking at my grandfather's sister, Assunta Iamarino. My oldest cousin from that family was born in 1948. 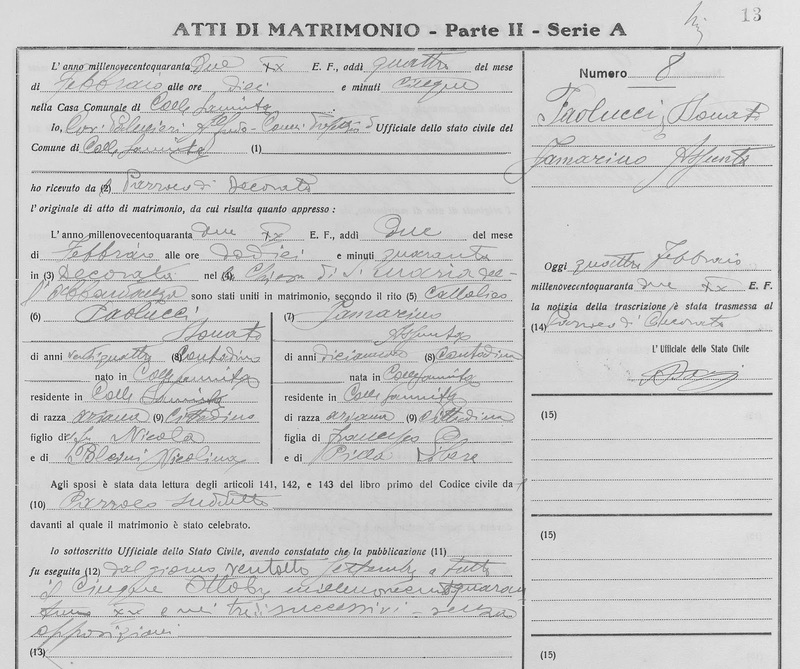 The online marriage records from their hometown of Colle Sannita only go as far as 1942. 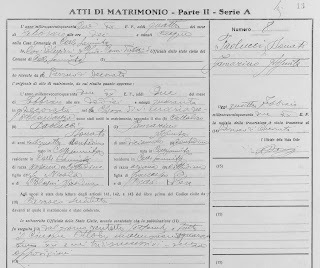 It seemed unlikely that Assunta married any earlier than 1946, but I decided to take a look anyway. What a huge payoff I found in 1942! Much to my surprise, Assunta and her husband Donato announced their intention to marry in September 1941. They married in February 1942. Their marriage documents confirmed their birth dates for me, too. But 1942 wasn't finished surprising me. Paging through the marriage documents for that year, I saw two more brides named Iamarino. Checking my family tree, I realized they both belonged to me. and each married in 1942. 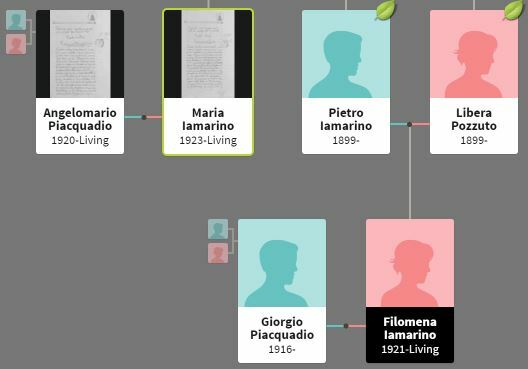 Maria Iamarino wasn't in my tree yet, but when I saw her parents' names, I knew exactly who she was. 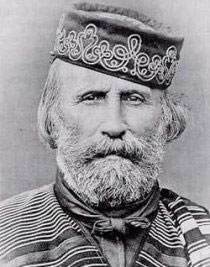 You see, her father Teofilo was the brother of my great grandfather Francesco. And her mother Filomena Pilla was the sister of my great grandmother Libera. Two brothers married two sisters and mushed together the branches of my family tree. Then I found Filomena Iamarino's marriage. Filomena was born two years before Maria Iamarino, but she was Maria's niece! Her grandparents were Teofilo Iamarino and Filomena Pilla. Finally, 1942 gave me the marriage of Vincenzo Pilla and Teresina Piacquadio. They were already in my tree with no details. I knew their names only because a distant cousin, the nephew of Teresina Piacquadio, had given them to me. Now I have more facts and proof. In one whirlwind session, leafing through one town's marriage records for one year, I found four marriages that matter to me. This highlights the importance of finding more than your direct ancestors. Marriage records give you another data point for those ancestors and help fill in the gaps. When I visited Assunta's children in Italy in 2005, they showed me the remains of Grandpa's house. It's on the property of one of Assunta's children. Grandpa left Italy in 1920. In 1922 when Assunta was born, my great grandparents lived at Via Leandro Galganetti, 46. Google Street View shows that address as a pile of rubble now, far from Grandpa's house. In 1942 when Assunta married, the family lived in Decorata. That's past Grandpa's house, and a good distance from Via Leandro Galganetti. This expands what I know about my great grandfather Francesco. 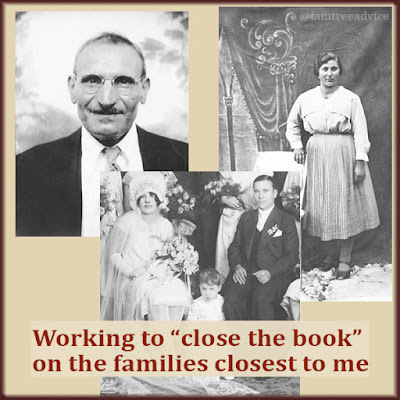 He came to America five times, leaving his family behind in Italy. He must have earned money and gone back home each time. Now I can add to that profile that the family moved around within their town. They didn't stay in an ancestral home. How much will your family history benefit from looking in all directions for relatives? Don't stay only on the straight and narrow path. Each data point you find paints a richer portrait of your ancestors. All last week I was looking forward to my three-day weekend. I would have so much fun with non-stop genealogy! Chasing genealogy facts is this much fun. Saturday was great. I identified more than 200 people in my family tree who were not connected to me. These are families I think belong to me, but I haven't yet found the connection. And I also found 11 people to delete from my tree. Sunday was full of distractions. Once things settled down, I got productive. I documented in a spreadsheet every 1810 marriage from my Grandpa Iamarino's hometown. Log my downloaded documents from the Antenati website into a spreadsheet. Find my parents' connection (our DNA says they're distant cousins). 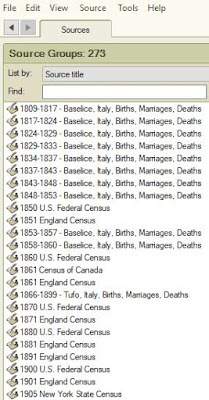 I hope these early Italian vital records contain the ancestors my mom and dad have in common. Yesterday I had a wonderfully productive day documenting these towns. 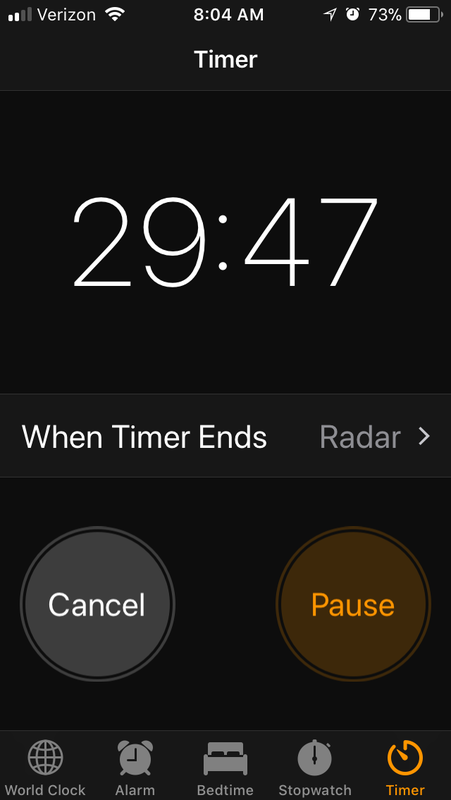 I'm using a time-saving, productivity-boosting technique that you can use, too. all the facts and put them straight into my family tree. I have thousands of vital record images from my ancestral Italian hometowns on my computer (and backed up in two places). Now I have to harvest them for family tree information. Slogging through one year of marriage records for one town, as I did on Saturday, is very slow and tedious. If I weren't obsessed, I'd have given up. Open up your family tree software. Go through an image collection, such as one year's marriages, one at a time. Enter the most basic information for each document into your data spreadsheet. This could be nothing more than the document number and the names and ages of the bride and groom. When you see a last name of interest, check your family tree. Are the bride or groom in your tree already? How about their parents? When you find a match, even if it's a distant match, examine that document. Enter all its facts into your spreadsheet. 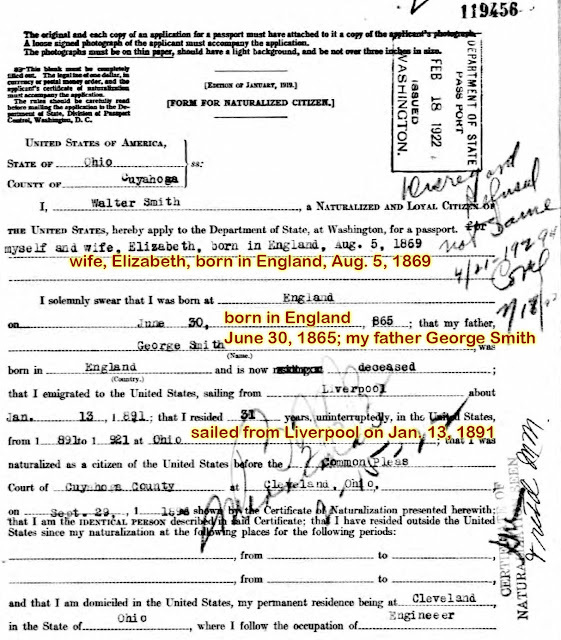 If this document belongs in your family tree, put the facts and image into your tree now. I followed this method yesterday with Photoshop open, too, so I could crop the images before putting them into my tree. Thanks to this more efficient method, I completed the 1811 and 1812 marriages. All the basic information from these hundreds of documents is in my spreadsheet. Plus, the 10 or so marriages including my maiden name of Iamarino are now in my family tree. I can see it now. I can see how I'm going to spend nearly every waking moment when I hit retirement age. This passion for genealogy gives us all a reason to live to at least 100. We'll never be finished with our genealogy research. But the search is very much part of the fun. Reliable sources make a reliable family tree. No offense to my third cousin once removed, but I can do better. If my family tree has facts whose only source is my cousin, that's not good enough. Hearsay—even if it's someone's first-hand knowledge—is not a reliable, reproducible source for your family research. That's why I'm on a mission to verify every fact in my tree that has a person or someone's online tree as my source. They're good leads, and I appreciate them tremendously. But without evidence, they are only leads. I need to find proof. I've been scrubbing my family tree in a bunch of ways lately. I cleaned up every address in my family tree to have a consistent format and take advantage of Family Tree Maker's address verification. I attached every census form or ship manifest in my tree to each person named in the document. I beefed up my source citations with more information and weeded out duplicates. Now I'm going after imperfect sources. I started by picking two sources that are far from bulletproof. I'm not happy at all with one large branch from Virginia that relies on (a) someone else's tree and (b) "One World Tree" as its sources. Two collections on Ancestry.com have a lot to offer this branch. I found Virginia marriage listings and death certificates for several people. I added the two Virginia source citations to the facts and removed the sources I don't find as valuable. You, too, can fortify your family tree by using the most reliable sources. 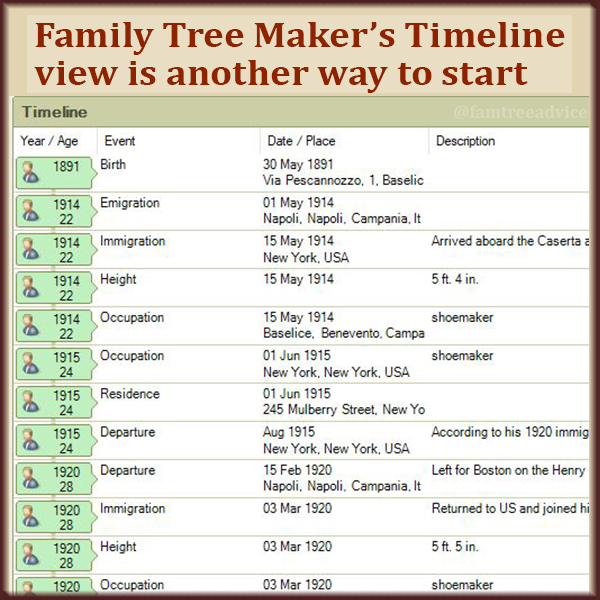 First, see if your family tree software can show you a list of all the sources you've created or attached to people in your tree. Family Tree Maker lets me view my sources in a few ways, including by repository. The repository tells others where you found this fact. 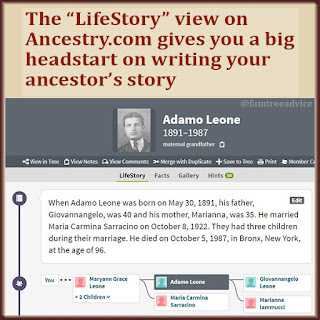 I added the Repository (ancestry.com, familysearch.org, etc.) to each source citation that's from a website. I added the New York City Municipal Archives as a repository, too. That's where I went to see lots of birth, death, and marriage records for myself. 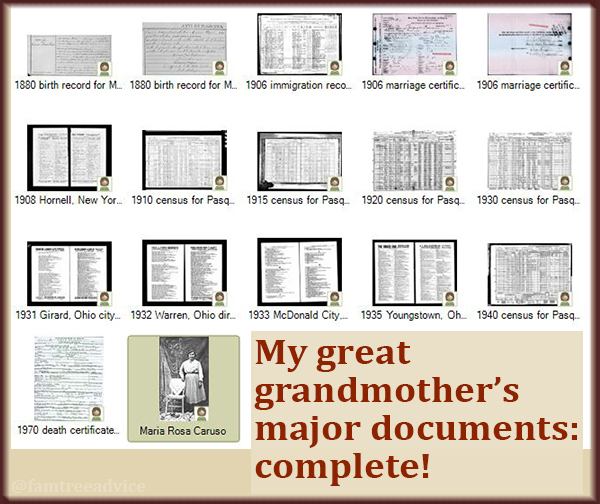 I can also view the complete alphabetical list of source titles in use in my family tree. That list shows me which sources I want to replace with something better. When I select a questionable source, like One World Tree, I can see exactly which facts are using it as their source. 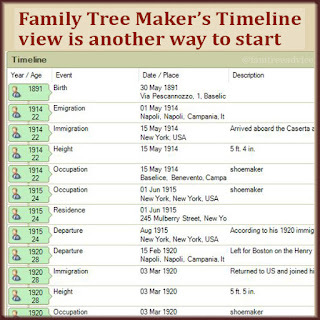 If you have FTM, or your family tree software acts in a similar way, look for sources that come from another person's tree or a name. (When the source is a cousin, I name it to make that clear, e.g., "Joseph Collins, my cousin".) 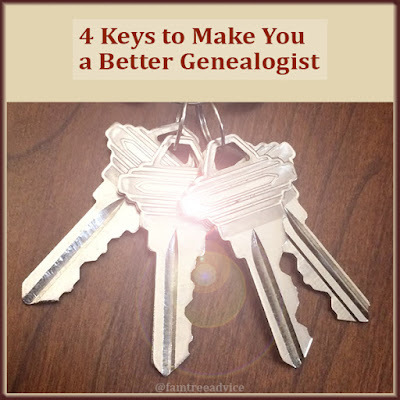 While you may believe your cousin, other genealogists have no reason to! Start working through those facts. 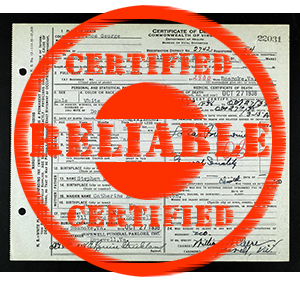 Search for a recognized, reliable source to back up your cousin's information. 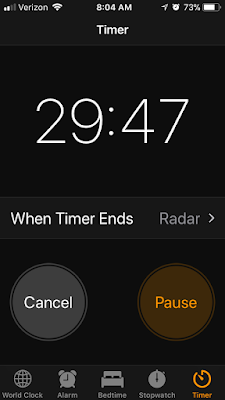 You can keep your cousin's name there if you want to, or put their name in your notes. Zero in on sources that don't carry much weight and trade up to better ones. The goal is to make every fact in your family tree provable. 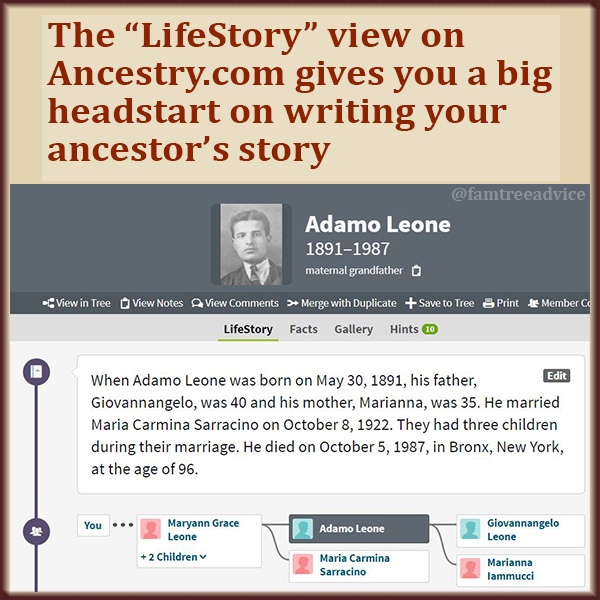 Trade up to more reliable sources and you will fortify your family tree.